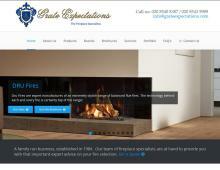 Grate Expectations are specialist suppliers of fires and fireplaces in London and Surrey. Their showroom showcases some of the most elegant and innovative models of gas and electric fires, wood burning and multi fuel stoves and marble, wood and stone fireplaces. Grate Expectations offer the complete package, from giving friendly advice on the best fire and fireplace combination for your home to installation by their own HETAS & Gas safe registered installers. Chimney lining & testing is available in the London, Surrey & Sussex areas. A complete range of natural gas, wood burning and muti fuel patio heaters to heat your outdoor space efficiently.